Josie d'Arby celebrates the golden jubilee of Liverpool's iconic Metropolitan Cathedral. There is also music to celebrate the Feast of Pentecost. 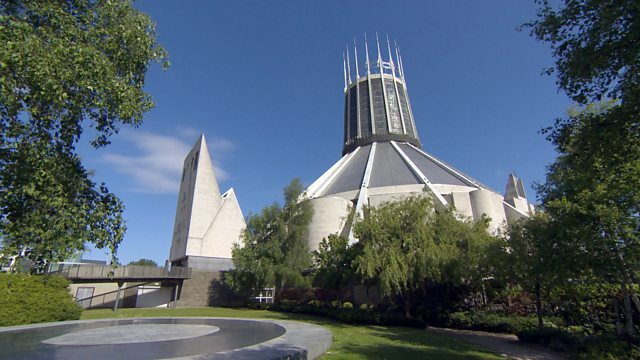 Browse content similar to Liverpool Metropolitan Cathedral. Check below for episodes and series from the same categories and more! Roman Catholics celebrated as they consecrated a brand-new cathedral. a cathedral for the city's growing Catholic population. A story of frustrated ambition. it captured the mood of the age. as profound as what happened then. as they prepare to make their first communion. of being closer to God. We've music to celebrate the Feast of Pentecost. And I'm on the trail of John Wesley, the founder of Methodism. with the purchase of the site of Liverpool's old workhouse. in a grand ceremony for which our first home was specially composed. and spiralling costs meant all grand plans had to be abandoned. that reflected the new post-war era. This famous cathedral is the result of a competition launched in 1959.
sent in from around the world. overseeing the construction of the winning design. Working here was extremely exciting. This design proved a construction challenge, not least. I remember being right at the top of the lantern on the outside. And this was in the days before health and safety had been invented. It was a bit hairy at times, yes, I remember. Tell me about the media buzz that surrounded this building. "How did you know that the acoustics were going to work?" said, "We do know because we've fired a gun." a re-enactment of this firing a gun. and saying could I borrow a revolver for half an hour, please? But that was in all the broadsheets at the time. which had this picture of me firing a revolver. But the headline in his newspaper said "Architect Shot In Cathedral." And apparently he fell off the seat in the train at the time. One particularly special moment was the day before the actual opening. for any of the workmen to stop whatever they were doing. I remember hearing this singing. and this intense change came over the building. It stopped being a building and it became a sacred place. And it affected me so much that I just cried away. It was a wonderful, wonderful experience. the long struggle to build Liverpool's Metropolitan Cathedral. Well, I went to the consecration. There were nearly 3,000 people in the cathedral. was playing for the first time. our cathedral, after having had nearly 100 years of waiting. You go through the doors and you go, "Wow." You are met with this huge open space unsupported. very intense and deep, representing all the beauties of God's nature. That looking up is almost a prayer in itself. When the cathedral was opened, it was absolutely bare. There wasn't a single solitary embellishment in it. the sculptors contributed the Stations of the Cross. And so much of it is local work. and how over the years it would go on developing the way it has done. It's a great joy and privilege to have that as my parish church. described the people of Liverpool as being "much alive to God." was the founder of a new branch of Christianity. attended a service here, you would probably have been really bored. you got an old-fashioned liturgy and sermons that could last for hours. psalm to chant, if you were lucky. This is all assuming you wanted to come in in the first place. was a certain John Wesley. to worship and what it meant to be a Christian. John Wesley was from a family of Lincolnshire clergy. he was back in London, disconsolate and unhappy. Then, on 24th May, 1738, he came to a service on this spot. This monument carries his description of what happened that night. "through faith in Christ, I felt my heart strangely warmed. "I felt I did trust in Christ, Christ alone, for salvation." the men and women of the early Industrial Revolution. in cottages and in halls, and in the open air. Wesley intended Methodism to be a society within the Church of England. so it started to build its own worship spaces. One of the earliest is here, on London's City Road. And it's here that I'm meeting the Reverend Dr Leslie Griffiths. I've often wondered, where does the name Methodism come from? so methodical that they were called Methodists as a term of reproach. what's it like following in his footsteps, as it were? It's a little bit intimidating. but John Wesley's statue out in the yard here is facing into the world. His people must also face into the world. the direction of a smile. a good library and the Methodist Church. and it has a lot of patterns on. has loads of diamonds on. special day of being closer to God. I've been practising with everything so I know what to do on the day. -"Isaac and Rebekah had two sons..."
-Gracie is nine years old. a short walk from her home at the Metropolitan Cathedral. very big and it has nice crosses at the top of it. So this is my cake. So this is what happens when you have the best grandma ever! you become more of a Christian. So the Father says, "This is the body of Christ,"
and then we eat it and remember it's Jesus. And we do the same with the wine. The wine is normal wine and it's blessed. it's having its birthday, and the children get to be part of that. # Have we trials and temptations? # Is there trouble anywhere? # Can we find a friend so faithful? # Can we find a friend who will all our sorrows share? # All our sorrows share? # Cumbered with a load of care? # Do your friends despise Forsake you? # Do you need a friend? They're surrounded by family, friends and the Cathedral community. So, children, this is it! something you'll remember for the rest of your lives. and remember that God is always with you. when they called out my name, I was, like, "Oh!" I got to wear a lovely dress and I got to have a lot of fun. carers make to our families and communities. Josie d'Arby is in Liverpool to celebrate the golden jubilee of the city's iconic Metropolitan Cathedral and to share a very special occasion with two of its young parishioners. And there's music to celebrate the Feast of Pentecost. Hail Redeemer, King Divine from Liverpool Metropolitan Cathedral Lord Of All Hopefulness from Lutyens Crypt at Liverpool Metropolitan Cathedral Here Is Love, Vast As The Ocean from All Saints Church, Ecclesall O Thou Who Camest From Above from St. Alban's Church, Bristol Bread Of Life from Holy Trinity Catholic Church, Sutton Coldfield Holy, Holy, Holy from St. James the Greater, Leicester What A Friend We Have In Jesus by St. Peter's Church of England School Choir.